DISCOVER DAY at the DAY PROGRAM is an arts centered workshop series designed to be an expandable adjunct to Day Program regular programming. This is not a curriculum-based program ,it is a creative outlet. It is an enrichment series that will be designed to complement curriculum-based programs already in place. Each teaching artist will have the goal of inspiring the students to create, thereby leaving The DAY Program with a more “inspired” and engaged student body. This program is provided at no cost to The Day Program through the efforts of Leadership Shelby County and The Shelby County Arts Council. 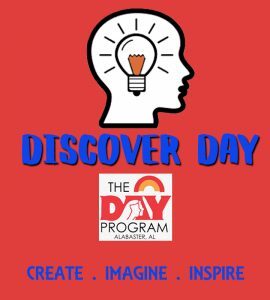 Each year Leadership Shelby will help SCAC secure funding for the Discover Day Program. **In 2018 that will be KELLIS VEGETATION. *Leadership Shelby Day : The first year will be “Law Enforcement Day” We are proposing an additional day each year for future Leadership Shelby Teams to feature career education of choice. The Need: Executive Director of The DAY program Kathy Miller expressed a need (and a desire) for arts/creative enrichment programming, saying that enrichment programming was a need but not in the scope of their ability to offer without outside help. Shelby County Arts Council: SCAC is an 11-year-old 501(c3)nonprofit that can serve as the fiscal agent and legacy organization to keep this program viable, credible and scalable. In the future with proper implementation and results, this program would likely be eligible for grant funding and other fundraising efforts. Alignment with a 501(c3) fiscal agent will legitimize fundraising and funding for years to come to make the program sustainable. SCAC is already running a similar arts enrichment program at the Shelby County Juvenile Detention Center. The program is in its 7th year there with great results. The Beginning: Leadership Shelby County’s 2018 class team #1 was the catalyst to get this program started and established. This group raised the funds by securing sponsorship from Kellis Vegetation necessary for the first-year program budget. *To give the students a “break-through” moment of inspiration. All teaching artists are charged with the goal of completing a project start to finish in one session, crafting exercises and projects that engage students and surprise them with their own creative ability. *To give teachers a dependable reward system. Good behavior “buys” a ticket to each workshop. *To leave The DAY Program students more inspired and engaged in their academic pursuits. In order for these teaching artists to prioritize the date and for us to schedule dependable sessions, we propose a modest $2,000.00 first year annual budget for payment to instructors. They will be worth much more than that, but we believe we will be able to get them to discount their normal fees for this program. We propose that most supplies and administration of the program will be donated or otherwise sponsored bringing the annual cost of the program to about $2,400.00.